Force 8 is a leading manufacturer in exclusive door designs that you won’t find anywhere else. Furthering this, Force 8 can manufacture products that can replicate materials that we don’t use such as timber and aluminium. Each of our products is made from composite material, allowing for an aesthetically pleasing finish as well as being safe and secure, ensuring that you will have peace of mind for your home. 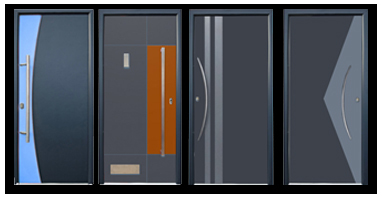 Even our decadence door range which gives the impression of aluminium is made from composite material, giving you the chance to have a spectacular looking aluminium door with all the benefits of a composite door. Furthering this, as our decadence door range is all composite material, you will save on costs since an aluminium door can cost up five times more than a Force 8 composite door. Their industry exclusive composite door portfolio has introduced the Oslo, Bergen and Geneva doors to the exclusive decadence door range. Each of these designs features intricately grooved designs, giving an individual and distinctive finish. The demand for coloured doors has driven the market for a while, but no one had thought of combining two colours in such a contemporary fashion. This is a unique door collection which is available in their wood grain effect texture or smooth finish. Some of these designs will be displayed at this year’s FIT show in May. For 30 years, Force 8 has been manufacturing and installing high quality composite doors in the Cheshire and Stockport area of Manchester as well as being known nationwide for our amazing quality products and deliveries. Don’t hesitate to contact us to discuss the options that we are able to offer you. Visit one of our showrooms or call us on 0161 483 1997.